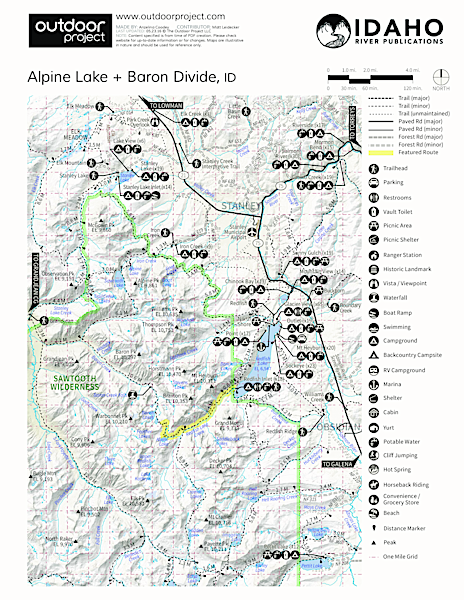 The Alpine Lake Trail is accessed from the main stem of the Redfish Lake Creek Canyon. Access to the canyon is typically via a shuttle boat across Redfish Lake. 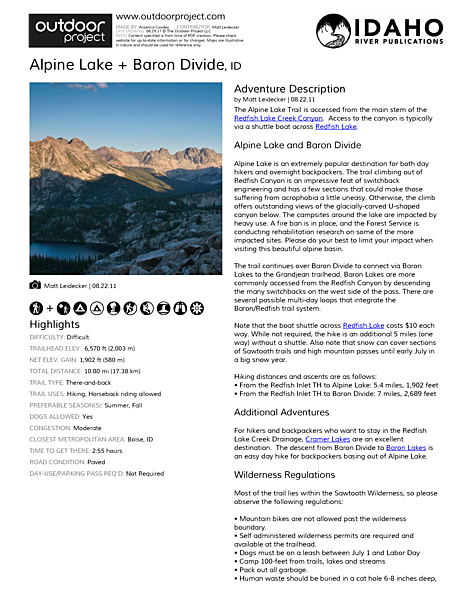 Alpine Lake is an extremely popular destination for both day hikers and overnight backpackers. The trail climbing out of Redfish Canyon is an impressive feat of switchback engineering and has a few sections that could make those suffering from acrophobia a little uneasy. Otherwise, the climb offers outstanding views of the glacially-carved U-shaped canyon below. The campsites around the lake are impacted by heavy use. A fire ban is in place, and the Forest Service is conducting rehabilitation research on some of the more impacted sites. Please do your best to limit your impact when visiting this beautiful alpine basin. The trail continues over Baron Divide to connect via Baron Lakes to the Grandjean trailhead. Baron Lakes are more commonly accessed from the Redfish Canyon by descending the many switchbacks on the west side of the pass. 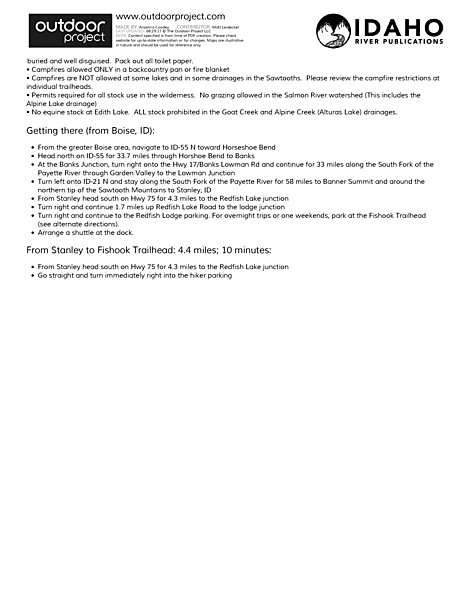 There are several possible multi-day loops that integrate the Baron/Redfish trail system. Note that the boat shuttle across Redfish Lake costs $10 each way. While not required, the hike is an additional 5 miles (one way) without a shuttle. Also note that snow can cover sections of Sawtooth trails and high mountain passes until early July in a big snow year. For hikers and backpackers who want to stay in the Redfish Lake Creek Drainage, Cramer Lakes are an excellent destination. The descent from Baron Divide to Baron Lakes is an easy day hike for backpackers basing out of Alpine Lake. Stunning canyon hike. Easy shuttle boat access. Glacial geology. Can be crowded. Boat shuttle fee. Heavily used campsites.